Finding the top things to do in Istanbul isn’t all that difficult since this is one of the great cities to visit in the world. 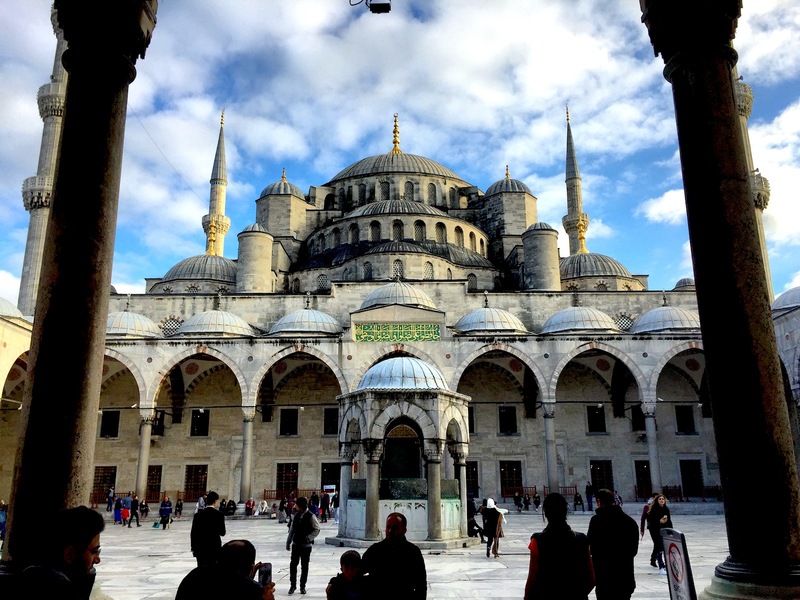 If anything, the challenge is narrowing down which of the top things to do in Istanbul you can fit in depending on how much time you have there. With thousands of years of history, countless museums and attractions, dozens of interesting neighborhoods, a thriving restaurant, bar and cafe scene, and a population of over 15 million people, the number of things to do in Istanbul is endless. 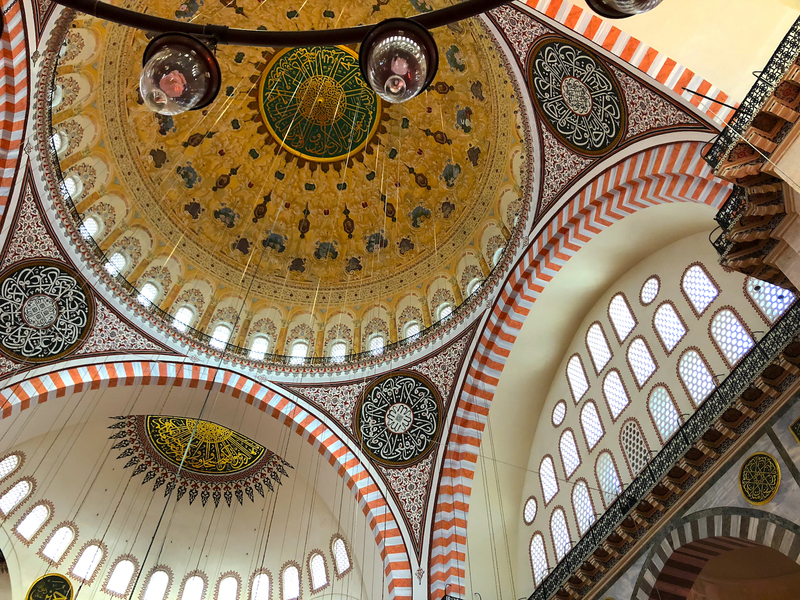 For first-time visitors, or for those coming back again with the goal of seeing more of the city’s top sights, here are my picks for the top 11 things to do in Istanbul. Beyond this list, try to meet a local, strike up a conversation, and you will sure to have an another 11 ideas in a matter of minutes. Standing at the top of a hill in Istanbul’s Golden Horn, Süleymaniye Mosque, or the mosque of Suleyman the Magnificent, is truly one of Istanbul’s greatest sights. Built by order of the sultan Suleyman I (also knowns as “the Magnificent”), the mosque was built over a span of 7 years between 1550-1557, and today still remains the largest mosque in the city — not a small feat given the number of mosques here. Enter by way of the courtyard in the front, and once inside the mosque, you can gaze at the towering domes, the tallest of which rises 173 feet, and take in the ornately decorated ceilings covered in floral and geometric designs. 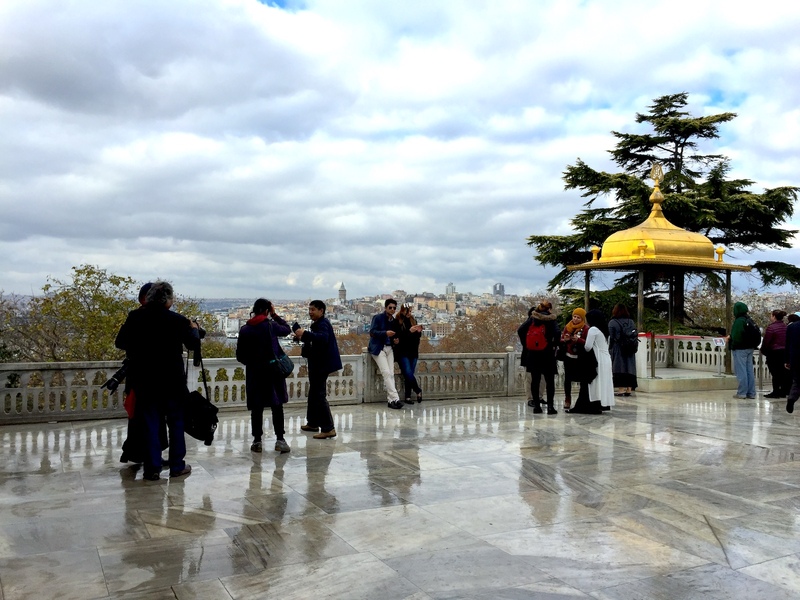 Be sure to exit out the rear and visit the large terrace — a great spot to take pictures — where you will be greeted by a spectacular view of the Golden Horn and Bosphorus. Probably Istanbul’s best known attraction (next to its food), is the glorious Hagia Sophia (or “Aya Sofya” to the Turks). The building has a complex history. First built by the Byzantine emperor Justinian and consecrated as an Orthodox church in 537, the church was then converted over to a mosque by Mehmet the Conqueror almost a century later in 1453. Finally, in 1935, it was declared a museum by Atatürk and remains so for the foreseeable future. Declared a World Heritage by UNESCO, it is considered one of the greatest surviving examples of Byzantine architecture. Make sure to set aside at least 2 hours when visiting Hagia Sophia. The lines to enter through security can be long, and once inside, you’ll want to take your time wandering the cavernous interior, including the upper floor where you can see the famous 12th and 13th-century mosaics depicting Christ. Between the 15th and 19th centuries when it was the court of the Ottoman empire, Topkapi Palace was the place to be and be seen. Built between 1466 and 1478 by the sultan Mehmet II and located on prime real estate on the Golden Horn, the palace remains a spectacle to visit. Surrounded by not one but two massive gates, Topkapi Palace was once home to over 5,000 people. Each successive Sultan that lived here added their own touch, helping to grow it to the size you see today. With a regular ticket you can visit the large kitchens, the Council Chamber where dignitaries were received and official business was conducted, and the private gardens and living quarters of the Sultan. Though a separate entrance fee, you would be missing out if you didn’t also visit the Harem, accessible after the second gate. The 300-room harem is a labyrinth of enclosures where over 300 concubines and the Sultan’s extended family lived, and where you can visit some of the ornate rooms where he and his wives spent a good amount of their time. Not so long ago, back when fresh water was less plentiful, Istanbul was home to over 200 hamams, or Turkish baths, where locals could go for a full body wash. Today, around 60 still exist, and with the advent of indoor plumbing, most hamams exist as tourist attractions today. Nonetheless, this unique bathing experience is a fun way to steep yourself in a bygone era. Closer to what you would experience at your traditional spa, you can still expect a personal attendant who will rinse, scrub and wash you down thoroughly using a hamam towel (lightweight, flat-woven and traditionally made from Turkish cotton). For a convenient hamam close to the major attractions, visit the Ayasofya Hürrem Sultan Hamamı. Built in 1556 and named after the wife of Süleyman the Magnificent, its welcome foyer itself is an impressive sight, consisting of a multi-domed ceiling and wooden stairs leading to your changing rooms on several elevated levels. Set aside at least an hour and a half to allow yourself time to decompress with a tea and snack following your group scrubdown. An argument can be made that it’s the Bosphorus, the natural straight that connects the Black Sea to the Sea of Marmara and the Aegean Sea beyond, that made Istanbul the city it became over the years. This natural waterway runs straight through the city, separating it from what is known as the European and the Asian sides. 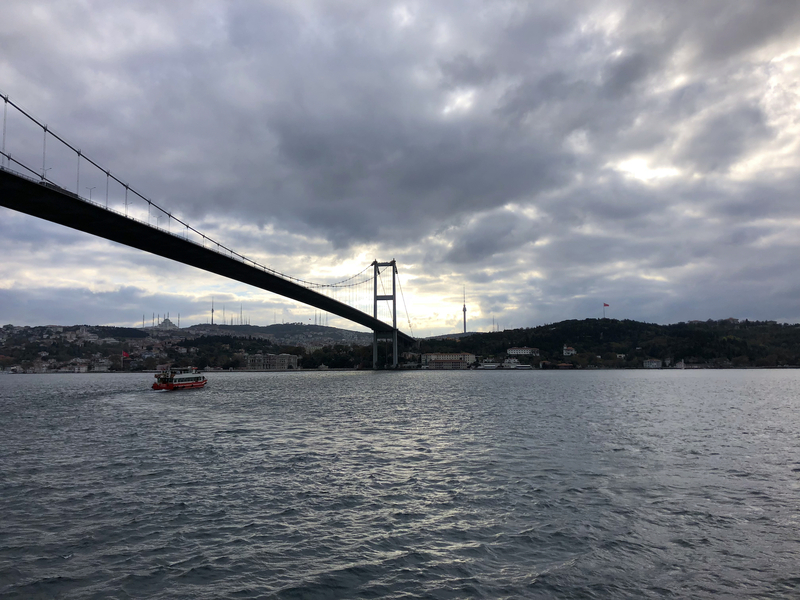 Most cruises on the Bosphurus last for about two hours and will take you north under the newly renamed 15 July Martyrs Bridge, further northward to the Fatih Sultan Mehmet Bridge, then turn around and head south towards the Golden Horn. Along the way you will be treated to views of the various palaces and estates that the royal families and the city’s richest inhabitants once used as summer homes, including Kucuksu Palace and Dolmabahce Palace. For a truly traditional experience, buy a Simit (a Turkish circular bread covered in sesame seeds) from one of the ubiquitous vendors, and throw bits into the sky to one of the seagulls that are sure flock your boat as it makes its way along (just be sure not to stand directly below any). 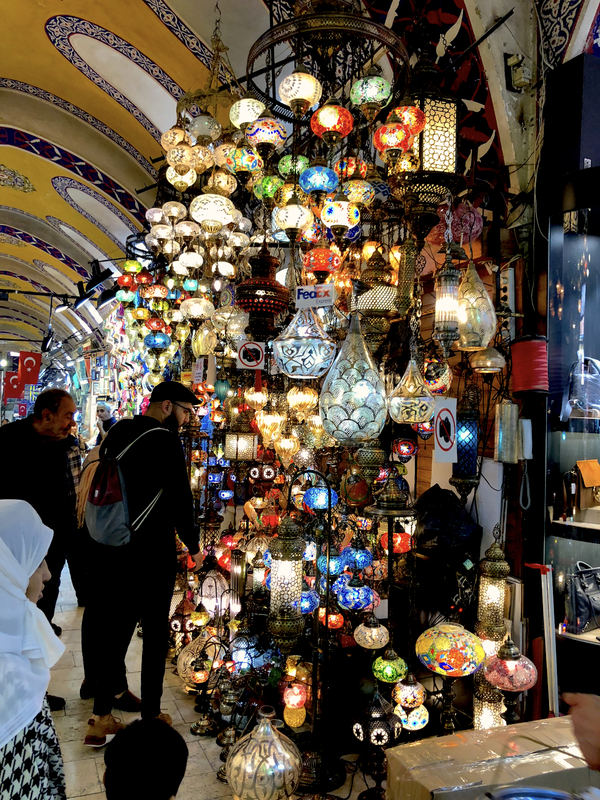 Perhaps nothing encapsulates Istanbul any better than its two most popular markets: the Grand Bazaar and the Spice Market. Chaotic, confusing, colorful, aromatic — one step into either market transports you back in time. The much larger Grand Bazaar is comprised of over 3,000 shops spread out over 7 acres, with shops ranging from the tacky and basic to high-end and unique. Beginning at one of the main entrances, the best way to navigate is to simply let yourself get lost among the cramped alleyways. When you’re ready to leave, try to orient yourself and exit north and head to the Spice Market, just a short walk away. Here the smaller market is made up of endless stalls devoted to selling various spices, Turkish delight, dried fruits, teas and other related items. Come hungry before lunch as you assuredly will be handed sample after sample from enthusiastic shop owners. 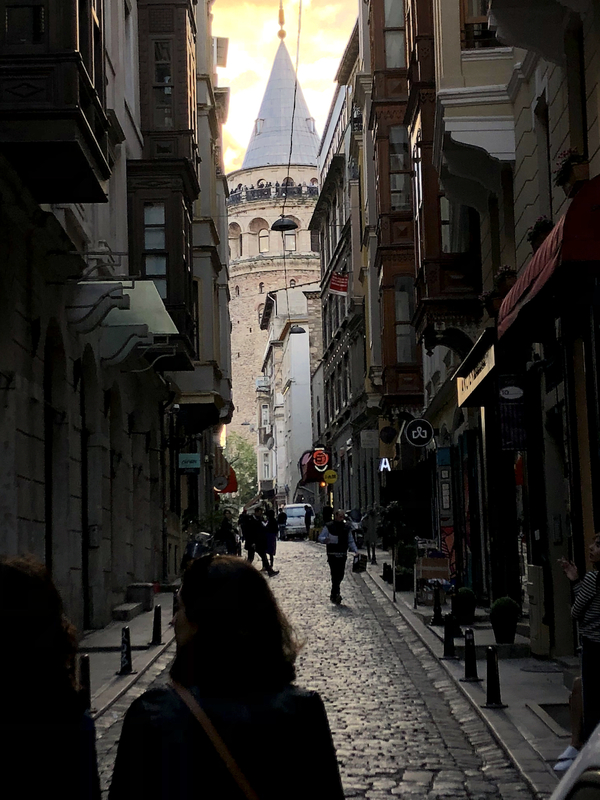 Beyoğlu, sometimes still referred to as Pera, and Karaköy are the pulsing heart of the city. Packed with restaurants, bars, boutique hotels, shops and non-stop foot traffic from both locals and visitors, these two neighborhoods are worth a day alone to wander around. Start by crossing the Galata bridge from the Golden Horn and into Karaköy and head to the one-stop Tünel, an 1,880-foot-long underground funicular dating back to 1875, making it the second-oldest subway in the world. From here you can backtrack and visit Galata Tower and the Istanbul Museum of Modern Art. 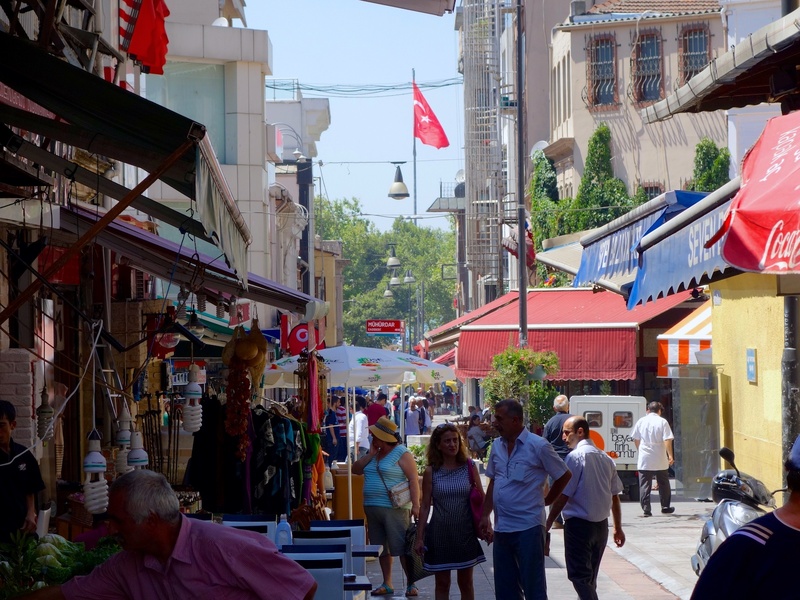 Then head to the famous İstiklal Avenue where at any given time of the day, tens of thousands of people are wandering along the pedestrian-only street. Finally, you will be let out at Taksim Square where you can take in the views of this giant open space. 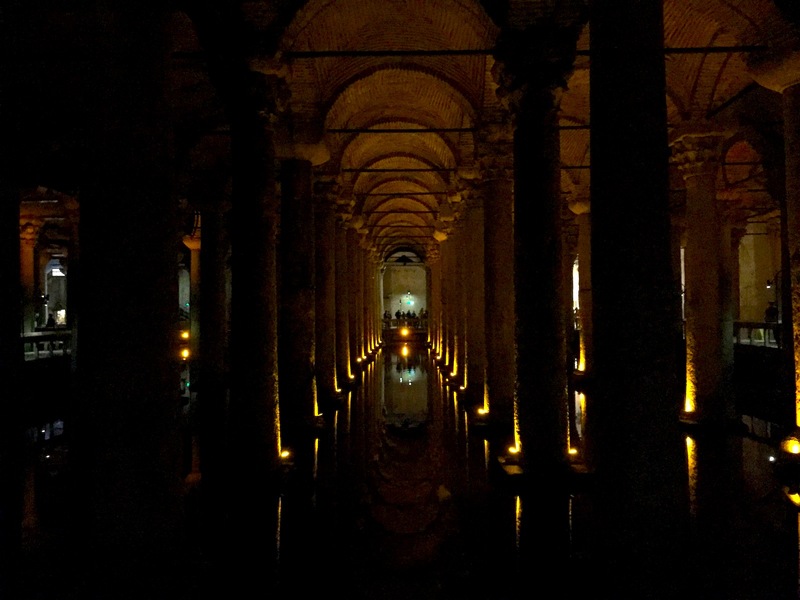 Just a short walk from Hagia Sophia and down a steep set of stairs is the Basilica Cistern, one of Istanbul’s most magical, subterranean sites. Built in the 6th century during the reign of Byzantine Emperor Justinian, the Basilica Cistern was the largest of the many hundreds of cisterns that once stored fresh water for the city’s inhabitants. Visiting today, the underground expanse is moodily lit, giving it an air of mystery as you wander past the 336 columns that support the structure along the elevated plankways that separate you from the water below. For its most famous sight, head to the northwest corner and find the bases of the two columns that are decorated with the haunting image of Medusa. 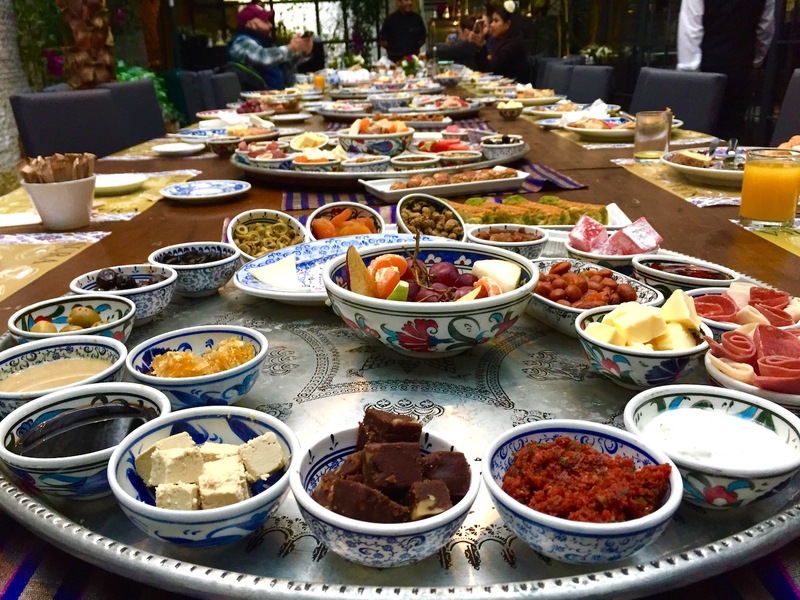 Breakfast in Turkey, or kahvalti, is a daily feast that will make you forget all about the wimpy brunches you’re used to back home. Let’s start with the foods. You should expect lots of cheese, including beyaz peynir (similar to feta) and kasseri (a medium-hard cheese made from unpasteurized sheep milk), a variety of breads including simit, the sesame covered circular bread that is often used to make mini breakfast sandwiches, lots of flavors of jams such as fig, apricot and cherry, butter and other spreads to go along with said bread, a good variety of fruit and olives, and if you’re lucky, sucuklu yumurta, a mixture of eggs and spicy sausage. Of course, this is accompanied by caffeine, usually tea, but for tourists visiting the country, you can rest assured that you will be able to have a cup of strong Turkish coffee as well. One of the most common refrains you will hear from local İstanbulites is that if you have time, you should make your way across the Bosphorus and visit the far less visited “Asian side” of Istanbul. Here, they tell knowingly, is where you you go to fall in love with Istanbul. Far from the crowds, the Asian side is much less busier, cleaner and more lush that its European counterpart. Start by ticking off many of the grand palaces you saw during your Bosphorus cruise, including the ornate, 19th-century Beylerbeyi Palace and Adile Sultan Palace, the former royal residence of Ottoman princess Adile Sultan and a great place to have dinner (at Borsa Restaurant) with its unforgettable views. Be sure to wander around the walkable neighborhood of Moda with its sidewalk cafes and boutique shops. For a truly spectacular view of the city, make your way to Çamlica Hill. At 879 feet, the view south over the city is unparalleled. At the top is a public park with teahouses, cafes and a restaurant. Sultan Ahmed Mosque, but more popularly known by visitors as the Blue Mosque due to its distinctly blue interior, was built by Ottoman sultan Ahmed I between 1609 — 1616. 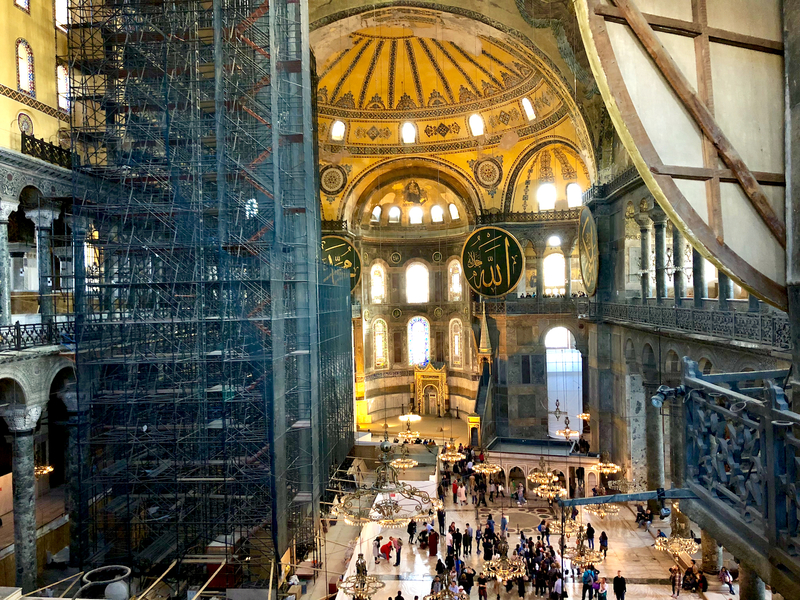 If it seems as impressive as its neighbor, Hagia Sophia, there’s a reason for that: it was built in direct competition in an effort to surpass its beauty. Surrounded by six towering minarets and curvaceous exterior, the building was and remains today an architectural wonder. Inside, the mosque is decorated with over 20,000 İznik tiles and has 260 stained glass windows. Be sure to visit early as admission is regulated due to its popularity. Turkish Airlines is the undisputed king when it coms to flying to Istanbul, the airline’s main hub. With over 338 planes flying to over 307 different destinations in 122 countries, it’s almost guaranteed that Turkish Airlines will offer you the best route to Istanbul. 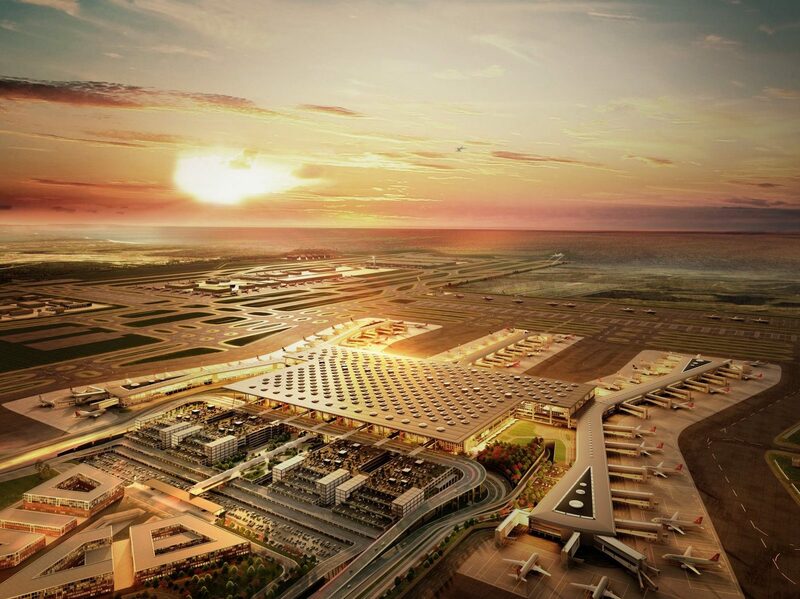 Even better, the new state-of-the-art, $12 billion Istanbul Airport will be the home for all flights beginning in March of 2019, and when it becomes fully operation in 2023, it will be the world’s largest airport. Turkish Airlines currently flies to nine cities in the United States and two in Canada, so it’s not only an airline with some of the world’s best service, it’s also one of the most convenient. If you’re looking to splurge a bit, the Raffles Istanbul is a great luxury hotel to call home in Istanbul. 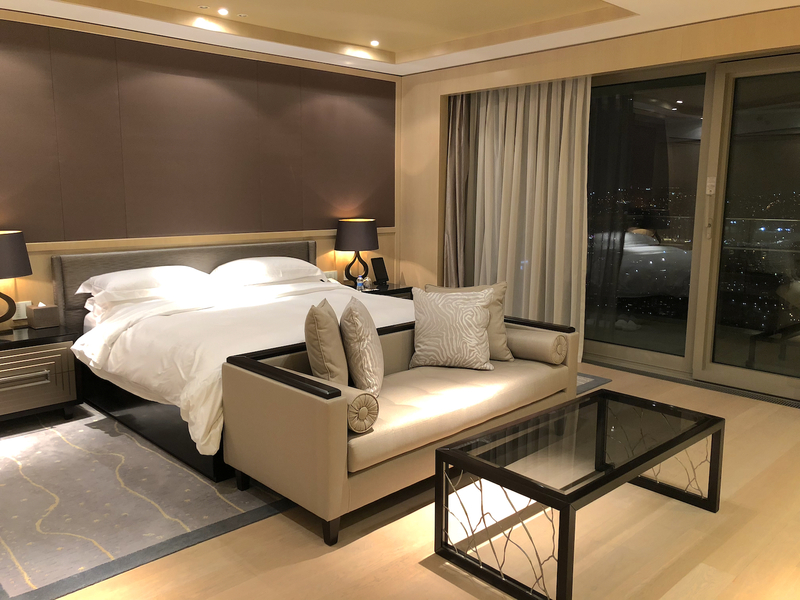 Located near the banks of the Bosphurus and above the Zorlu Center, a combined upscale shopping center and performing arts center, the hotel is located far enough from the bustle of the city to relax, but close enough so that most of the major sights are just a short trip away. 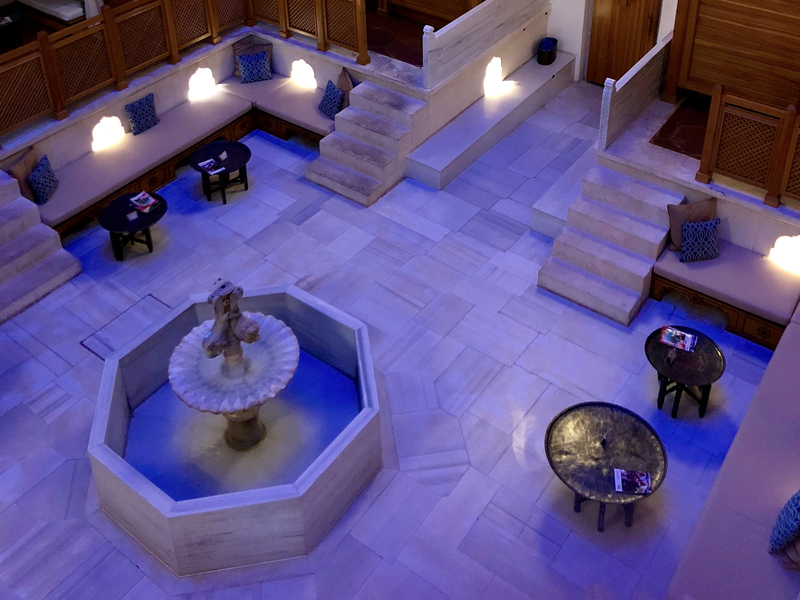 Opened in 2014, the hotel features a spa, the mediterranean restaurant Rocca Restaurant, and the lively Long Bar. 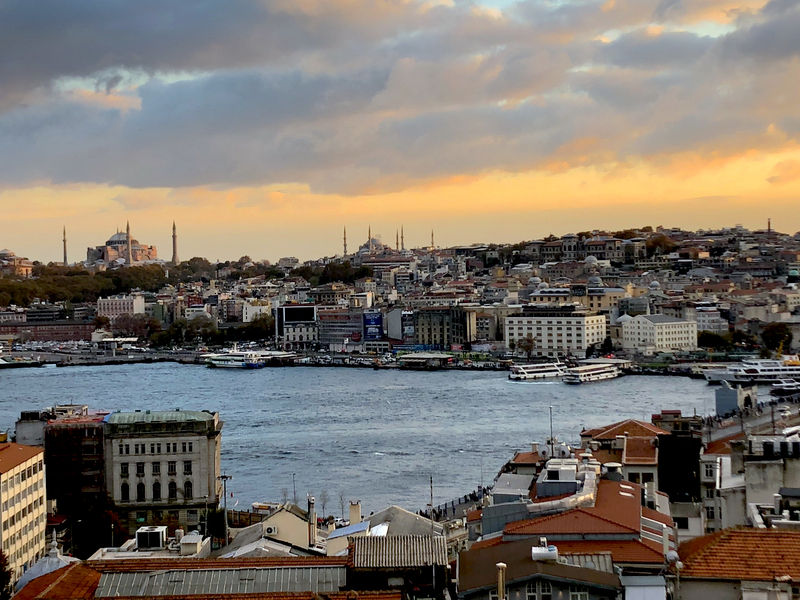 Be sure to try to book a room on the eastern side of the property that looks out over the water — the sprawling views of the Bosphorus and the 15 July Martyrs Bridge are spectacular both at night as well as during the daylight hours. Special thanks to Turkish Airlines, Turkish Airlines New York Office Corporate Department, and Crystal Concepts for providing assistance with this article.